Montferrat (Piedmontese: Monfrà; Italian: Monferrato; Latin: Mons ferratus) is part of the region of Piedmont in Northern Italy. It is both a historical and geographic area. It includes either a part of the Province of Alessandria, or a part of the Province of Asti. 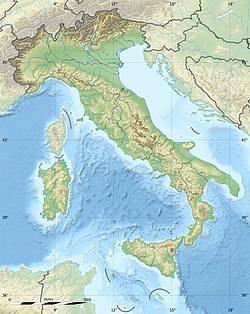 In the Middle Ages, it was a small marquisate (meaning a "small reign"), inside the Kingdom of Italy. Montferrat is famous worldwide for its soft and green hills. It produces award-winning wines, including Asti wine, Barbera and Moscato d'Asti. In June 2014, Montferrat, along with Langhe was declared a UNESCO World Heritage Site because of its unique characteristics. Monferrato Astigiano (Astesan Montferrat), which is the area of almost the whole Province of Asti (except Astesan Langhe). Its highest point, 549 metres (1,801 feet) above sea level, has been identified as the village of Albugnano. Montferrat has a strong culinary culture. It is one of the most important producers in the world of cheese, white truffle and other products of nature, such as vegetables, cereals and fruits. One of the best-known dishes of Monferrato is Agnolotti, which are a special type of filled pasta. This page was last changed on 5 April 2019, at 14:17.